Adoption Concerns: What About Medical History? 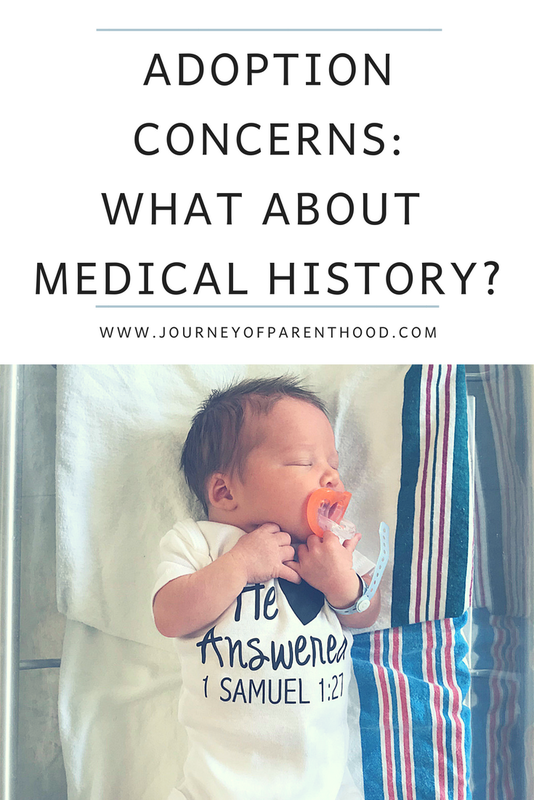 Something that is frequently discussed when it comes to infant adoption is medical history. It plays a role in many stages of the adoption process: How much are you able to know about an expectant birthmother before deciding to present or be matched? How much do you know throughout pregnancy? After birth? Each state varies when it comes to adoption. Even agencies within the same state may differ in their policies and practices. Truly every adoption situation is unique and may or may not be similar to another. It’s common for hopeful adoptive parents to enter into adoption imaging a “Juno” type situation. A young teenage girl who makes healthy lifestyle choices and just can’t raise a child. This is not the reality of adoption. Often times teenage pregnancies with a positive home life either end up opting to parent or have a family member who parents. Most of the time in domestic adoption situations the birth mothers are middle age (or approaching it) and are in a stage in life where they are struggling. Financially, physically, or mentally. It’s important for hopeful adoptive parents to enter into the process expecting, and understanding, that there is a high chance of addiction of some form or another in the life of the potential birth mothers they will see. This can be hard to accept. As someone who gave birth to three children and took pregnancy very seriously it was hard for me to fathom being matched with a pregnant woman who was not able to give her unborn child the best care possible. It’s helpful to remind yourself that if birth mothers were in a healthy situation in life, then they wouldn’t feel the need to choose adoption. Adoption is a beautiful, heartbreaking journey for all parties involved and is a decision made out of love and strength and courage on behalf of the birth mother towards her unborn child. The way our domestic adoption process worked was that we received information on potential birth mothers. This packet contained information gathered from the lawyer with the birth mother. Details such as the color of hair she had, her height and weight, even if she wore glasses. It included ages of her other children, her educational background, current career, future hopes, personal interests, and even personal feelings on why she was choosing the route of adoption for her child. There was always also some basic information about other family members. Any children, the birth father if known, as well as parents and even grandparents of the birth mother and father. Again these portions were either filled out by the birth mother or by the lawyer who was discussing them with her. Often times certain sections could be left completely blank and the information given was typically vague. For example it would say “health problems” with a box to check “yes or no.” Not super descriptive! Also included in all the forms filled out by the birth mother and lawyer were several pages for medical history as well as lists of medications/drugs the birth mother may have been taking at the time. Again, this was filled out typically by the birth mother herself and was just based on her knowledge at that time. Many of the packets we reviewed included a drug test done by the lawyer. This showed an 11 panel screening including alcohol. Often the packets we received also included photos of the birth mother. Out of everything we received my husband and I always took the most stock in the drug screening because that was a lab result. It wasn’t based on memory or what someone may think hopeful adoptive parents would want to see…it is based on fact. I’ve seen many hopeful adoptive parents show concerns regarding what they learn in these informational packets. It can be difficult to base the decision whether or not to present to a birth mother on such little information. And often the information that is fact-based (the drug screening) can be tough-to-swallow news. 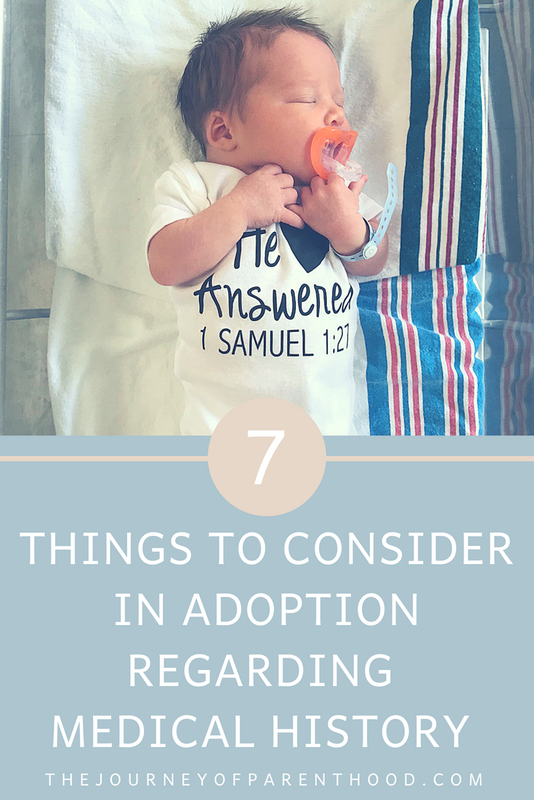 It’s a very personal decision between the hopeful adoptive parents as to what they may or may not feel comfortable with regarding the known medical history in deciding to present. In my opinion, adoption is one huge leap of faith. My husband and I talked in depth about how OUR family history packet would look like. How do WE read on paper? My husband’s family has a strong history of auto immune disease and my side of the family has some mental illness. If we wrote out those forms would hopeful adoptive parents choose us to match with? Probably not! We never let any sort of family history deter us from presenting to a birth mother. We also took the drug screening with someone of a grain of salt. We presented to several birth mothers and reviewed even more packets and majority of the time there were some sort of drugs present in the screening. But it’s also INCREDIBLE to see how strong these babies are! It’s like God protects them right from the start and it’s very common to have babies born addicted to hard drugs and then, once weaned, never show another symptom or issue ever again in their lives. And most drugs? The long-term affects tend to be things like learning struggles or adhd which are both super common anyway. And really the biggest concern, with the longest lingering effects on a child is fetal alcohol syndrome. Drinking alcohol isn’t really something that anyone can monitor anyway so it’s one of the many concerns that an adoptive parent really just has to set aside and not dwell on. If you’re wanting to do more research on how drugs and alcohol affect unborn babies and what to expect as an adoptive parent in these situations then this is a great place for solid information! I also have known many healthy families with healthy biological children who have given birth to children with major health concerns. We can do everything right and still have babies born who are sick or who have hardships. Sharing DNA isn’t a guarantee that you’ll give birth to a healthy child. Personally? We chose not to let any exposure to anything or any sort of medical history deter us from connecting with the baby God had planned for us. We prayed and prayed and just trusted in Him to lead us to our child! Once matched you will most likely be sent all of the medical reports from any pregnancy-related doctors visits up to that point in the birth mother’s pregnancy. Don’t be surprised if there aren’t any. It is also very common for birth mother’s to receive very little, if any, prenatal care. Throughout the remainder of pregnancy the adoptive family will also receive any updates or reports and even ultrasound photos. For us? These took AGES to reach us. It takes time for the doctor or hospital to release the files to the lawyer and then for them to get them to the adoptive parents. It’s a process. If possible, it’s a HUGE blessing to be able to attend the appointments with the birth mother. We were thankful to live within driving distance and were thankful that Mama E wanted me to come to appointments with her. Not only was this a great bonding opportunity for us, but it allowed me to have first hand knowledge on the pregnancy, how the baby was developing, and even help in some of the decision making (like when it came time for her to get her flu shot and TDap, I was able to advice her on both and she ended up getting them!). It’s very important to keep in mind that even though you may be matched, that the baby is still HER baby. It’s a very tender time and a delicate situation. I had many people tell me I should “not let the birth mother do such and such” or I needed to say “such and such” to her because “she was carrying my baby.” Nope. Not at all. It was, and still is, HER baby. HER body. HER pregnancy. HER decisions. I’m thankful I was able to attend the appointments and I do think our bond helped her in her decision making on some things, but I never felt it was “my right” to do or say anything. I was there to help and support HER. Be respectful. Be kind. Be supportive. Be grateful. Each state and situation varies when it also comes to the birth of the baby. My husband and I were fortunate enough to be in the delivery room when our son was born. We were fortunate enough to be able to have him room in with us during the 40 hours of waiting before Mama E could sign over her parental rights to us. We were also fortunate that he was born at a very adoption-friendly hospital where the staff treated out situation with tenderness and gentleness. Where they included both my husband and I in decision making and in any knowledge related to our baby. I personally still maintained my position as being there for Mama E. This baby wasn’t my baby until those forms were signed and I tried to be very sensitive to that and aware of the hurt she was experiencing during those days. When asked in the delivery room right after birth about certain medical items (like added goop in the eyes or when to bathe him for the first time), I allowed the staff to take the lead and told them I was comfortable with whatever they thought was best or what they did for “standard practices.” I personally wasn’t comfortable making those types of decisions right there in front of his birth mother right after she’d given birth. And I think I needed that distance in order to be able to handle the 40 hours of waiting until rights were signed over to us. We were given all medical information regarding his birth. Including results on the spot when they were able to be given (like his hearing test). We were also given information regarding his drug screening (the birth mother may or may not have one as well). Every single note taken at the hospital was sent to us and we had every detail regarding his delivery and hospital stay to keep. A common question asked regarding medical history and adoption is if/when an adoptive family is able to back out. The answer? Is at anytime. My personal truth behind that answer? Is never. If an adoptive family chooses to have a failed adoption then they are out any funds already paid towards the process (which, in our case, the full funds were all due within 30 days of matching). While it’s not something we’d ever personally choose to do, it is a comfort knowing it’s an option available to you. Adoption is scary for all parties involved and their are risks for each person. My personal belief, again, is that God was matching us with the baby who was meant to be ours. If that means health issues, then that’s what we’re meant to have. I cannot fathom having a birth mother choose us to raise her child and then for us to turn around and take back our end of the agreement. I know this may happen from time to time and I’m not coming from a place of judgement to those adoptive parents who may feel it’s best to terminate their match, but it’s just not something we even had to consider in our situation. Our son is almost nine months old now and there have already been so many times I wish I could know more about his medical history. I know it’ll always be something that is hard and that there may be moments in his life where knowing more about his biological makeup would be truly beneficial. 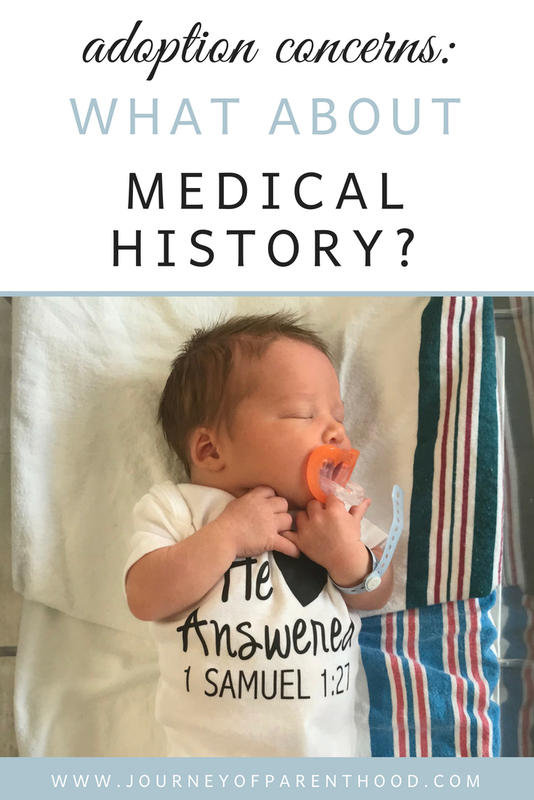 I went into every pediatrician visit at first feeling the need to explain how he joined our family and go over what history I knew regarding his biological family, pregnancy experience and birth. I finally asked our pediatrician at what point would all that stop mattering? His answer? Now. Yes our genetic makeup matters. It’s who we are. But it’s not who we’re meant to be. Raising a child who doesn’t share your DNA doesn’t mean they won’t share your qualities. It’s easy to get wrapped up in worrying about the “unknown” or even the known that isn’t so ideal. But those things don’t define us or our children. Do your research. Learn what you can. Make the best decisions you can make. Then let God lead and handle the rest. He’s got this. You can read more about our adoption journey here. And be sure to follow me on Instagram for daily updates on our family of four! Next Post Spear is 7 Months Old!